Tucson Daily Photo ~: Tucson's Tomatos - lots of them! FESTIVAL! Summer in Southern Arizona is in full swing, and local fields are overflowing with vine-ripened tomatoes, sweet-smelling basil, and enough garlic to make Italian grandmas swoon. 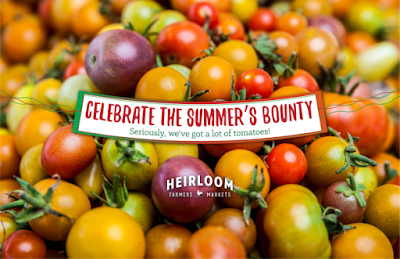 Celebrate summer's sweet and spicy bounty at Heirloom Farmers Markets' Tomato Basil & Garlic Festival on July 29 at the Rillito Park Farmers Market (4502 N. 1st Ave.) from 8am - 12pm. On Sunday at Rillito Park we'll be featuring Executive Chef Ryan Clark from Casino Del Sol's PY Steakhouse as our Chef at the Market! Taste how Chef Clark celebrates the season with a bowl of his Tomato-Basil-Garlic Gazpacho with Barrio-basil croutons, garlic oil, and sprouts.